LANGATA, April 6, 2011 (Daily Dispatches) – Five years ago, Abdi Kashel was a waiter in a safari lodge serving gin and tonics to well-heeled tourists. The only elephants he saw were those drinking at the watering-hole below the guest cottages, or the occasional distant herd spotted from the bus taking him home for holidays. 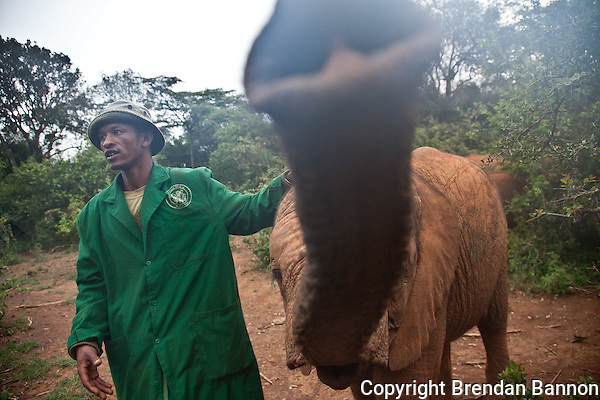 Today, he lives with elephants, full-time, in Nairobi. He watches over them as they browse the bush for fodder in the city’s National Park. He feeds them specially-formulated milk, every three hours without fail. And at night, he sleeps sharing a stable with one. Kashel, 34, is one of a dozen keepers at a refuge for orphaned baby elephants at The David Sheldrick Wildlife Trust on the outskirts of Kenya’s capital. Their work is profiled in a new 3D movie narrated by Morgan Freeman, Born To Be Wild, which opens at IMAX cinemas across the US this week. The elephants, some just weeks old, are flown to the city after they are found abandoned or injured in the bush, their mothers often killed by poachers, farmers or drought. The Trust, established in 1977, has carved out a reputation at the forefront of conservationists’ efforts to protect Kenya’s elephants from ever-mounting threats driven by Far East demand for ivory and domestic pressure on land. Four years ago, 47 elephants were found dead in the bush, often with their tusks hacked or power-sawed off. Since then, the number has been rising. Last year, 178 carcasses were found. Many, many more rotted away undiscovered. At the same time, seizures of ivory at Nairobi’s international airport and in raids across Asia have sky-rocketed. Last week, 247 tusks were found in a container in Bangkok, having been shipped from Kenya disguised as frozen fish. They were valued at more than $3.3 million. The poachers themselves – mostly villagers paid by middlemen for their deep knowledge of the bush and their poverty-driven desperation – are becoming increasingly sophisticated, too. A police raid in northern Kenya in January netted night-vision goggles and a telescopic scope for a rifle. “With drought, we already had problems,” said Kashel, feeding milk from an over-sized bottle to one of the 18 orphans currently at the Trust’s nursery. At the center of the Trust’s approach is a belief in teaching young Kenyans that wildlife is key to the country’s heritage and must be protected for their generation and all others to come. Parties of city children visit the orphanage every day. A mobile cinema drives deep into rural areas to show educational movies. Impoverished schools are given desks and sports kits paid for by the Trust’s supporters to illustrate the value people worldwide place on these majestic animals. On his first day on the job, fresh in the city from his family home far in Kenya’s north, even Kashel struggled. “I told them, ‘You want me to feed this animal, to spend all day in the woods with him, to sleep in the same room as him? If that’s the job, no way, let me go home now’,” he said, laughing at the memory. “I was too afraid. That first night, I stood in the corner, the other side of the stable from this elephant, never taking my eyes from him. ‘What am I doing here’, I asked myself. Friends refused to believe him when he talked of his new job. “Even my wife thought I was crazy. There are no elephants in the city, she said. What is an elephant doing in an orphanage, which is a place for baby humans? You say they are flown there, how does an elephant walk on a plane? She was sure I had lost my mind,” he said, his laugh deepening. And entertain the tourists they do. More than a million people visited Kenya last year, most drawn here by its famous game parks where herds sometimes hundreds-strong roam free. But around the borders of those parks, away from the luxury hotels like the one where Kashel used to work, millions of Kenyans are struggling to make the little money they need to feed their families. Booming populations mean limited livestock and crops must sustain ever more people. And then along comes someone offering money worth more than three, four, five years’ earnings in exchange for the tusks of one adult elephant. “It’s hard to argue with that, it is true,” concedes Kashel, his laughter now fading. Conservationists had recently felt confident they were winning the battle against poaching. A 1989 ivory trade ban, following 15 years of slaughter which killed half of Africa’s elephants, had cut demand significantly. But then, in 1999 and 2008, four southern African countries were allowed to sell stock-piles of ivory collected from dead elephants, first to Japan and then to China too. That refreshed demand, some conservationists argue, especially in China where the booming middle-class is developing a yearning for cultural trinkets traditionally marking wealth. Ivory tops that list. Around the same time, the government in Nairobi signed a series of contracts with Chinese companies to rebuild major roads across Kenya. Many of the routes they took passed close to areas rich in wildlife – Amboseli south of Nairobi, Samburu to its north. Senior Kenya Wildlife Service officials say China’s investments here are directly linked to the surge in poaching. The vast majority of air travelers intercepted with ivory at Nairobi’s airport are en route to the Far East. For Kashel and the other keepers here at The David Sheldrick Trust, the impact of all this is clear. Scanning down the list on the Trust’s website, under ‘reason for being orphaned’, poaching appears time and again – 44 times, in fact, of 112 elephants, more than for any other reason. 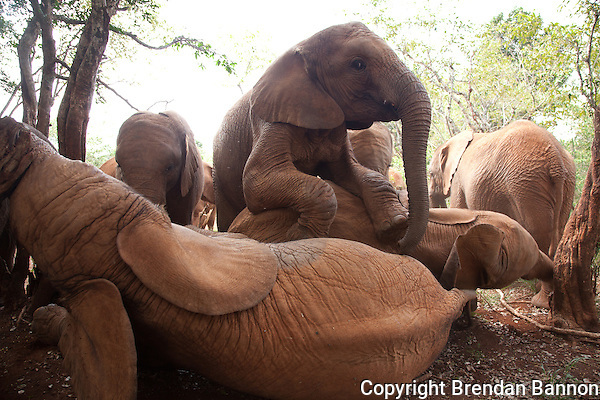 The most recent arrival is Sities, now 12 weeks old, who “walked into the headquarters of the Mgeno Ranch desperately seeking company” after poachers killed her mother. Then Ishanga, Mutara, Chemi Chemi, Turkwel and Tano, all rescued in one 10 week period in mid-2009, the worst year for decades for poaching. Punctuating their names are others trapped in wells, separated from their mothers for unknown reasons, or stuck unable to pull out of mud. All of them will stay at the orphanage until they are two or three years old. Then they will be moved from Kenya’s capital to Tsavo East National Park, the country’s largest, founded by the man after whom the Trust is named. There they will slowly be reintegrated to the wild. Leading the trotting elephants down their mud-bath, as small planes buzzed overhead on final approach to Nairobi’s Wilson airport, Kashel reflected on a potentially grim future. “These beautiful animals are cut down and killed just for two bits of something like bone on their face. Why?” he asked. 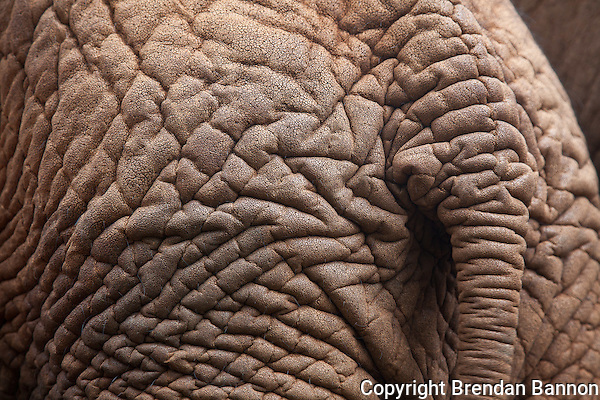 Related: See Brendan Bannon’s full-size of images from the elephant orphanage here. This entry was posted on Wednesday, April 6th, 2011 at 3:27 pm. It is filed under Adapting, Features. You can follow any responses to this entry through the RSS 2.0 feed. So sad that this can still be going on !!! This unnecessary slaughter of one the world’s most beautiful animals only continues because some countries still want to trade in ivory, contrary to CITES, and turn a blind eye to the poaching in order to get hold of the ivory. What is needed is the rest of the world to impose economic sanctions on those countries that it can be proven are involved. That way those countries will think twice and will crack down on what is happening. I sponsor Sities. it is easy to sponsor an orphaned elephant. 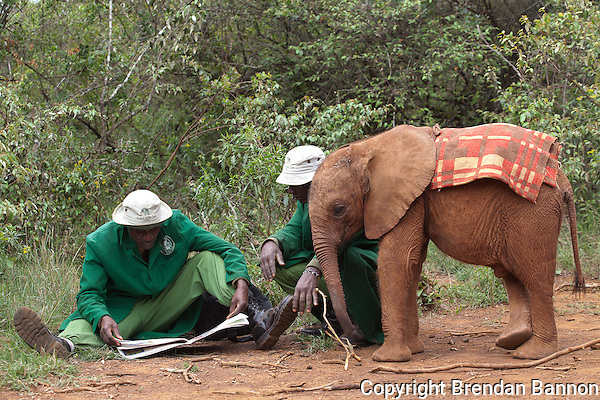 just go to the David Sheldrick foundation website and you too can be a sponsor. Education is the key, and help for people to earn a living and be able to feed their families. There are no pictures of women. What do the women do? Are they domestic? Do they have careers? Since Nairobi’s more modernized than most of Africa, are they treated with respect and are they even allowed to have jobs? Thank you so much for reporting on not only this important topic, but others as well. I really admire what you are doing. As an animal lover, I was touched by the keeper’s work at the orphanage and its general mission. Clearly others were impressed as well. Your work is stunning – your photographs are capturing stories that we’ve never heard before. That is a journalist’s true task – to tell the stories of the voiceless. Thank you for doing what you do.